Michael McFadyen's Scuba Diving - Pimpernel Rock The Solitary Islands run from Coffs Harbour to Sandon Point on the North Coast of New South Wales. This area has some of the best dives in Australia, if not anywhere in the World. 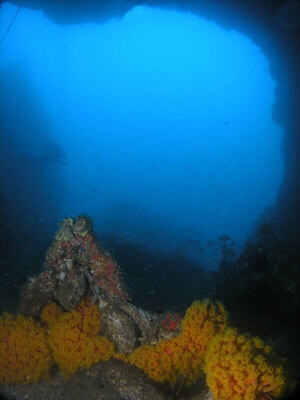 Most dives are done off Coffs Harbour at South Solitary Island and North Solitary Island off Wooli. 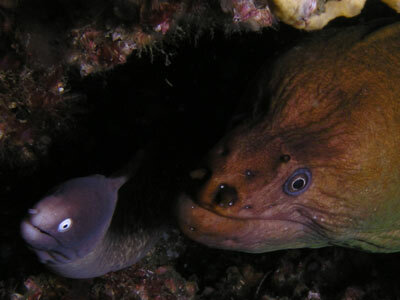 One of the best dive sites is further north than even North Solitary Island. Pimpernel Rock is located off Sandon Point in Yuragyir National Park. It is about 7.4 kilometres from here, 27 kilometres from the wharf at Wooli and 44 kilometres from Arrawarra Headland (where Dive Quest from Mullaway launches their boat). Therefore, if you have your own boat, the best place is to run from Sandon Point if it is a RIB or rubber duck or Wooli if it is bigger. For a charter boat, you really are limited to using Wooli where Stan Young of Wooli Dive Centre. Dive Quest will do this dive but it will certainly incur an extra charge due to the distance. 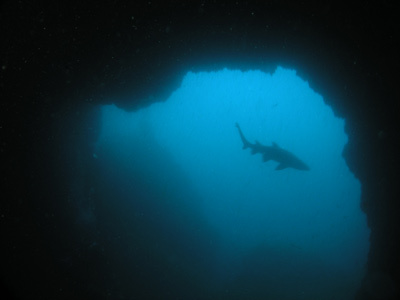 Pimpernel Rock is one of those mind blowing dives that makes you wonder why you even bother going overseas to dive. Located about seven kilometres from the shore, this site generally has very clean water but also can get currents. Head to GPS Reading 29º 41' 52" S 153º 23' 52" E. Note that all the GPS Readings on my Web Site are taken using AUS66 as the map datum. If you use another datum you may be about 220 metres off the site. See my GPS Page for more details and how to convert readings. The site itself consists of a sort of U-shaped rock pinnacle (when viewed from the top and facing north) which comes from over 40 metres up to less than 10 metres. The rock itself has three summits, the main one being at the bottom of the U and the other two near the ends of the U. These only come up to 15 to 20 metres. One of the features that makes this site even more special is that there is a tunnel running though the bottom of the U, with a smaller tunnel off to the right. There used to be a mooring attached to the shallowest part of the rock but now the charter boats anchor to the up-wind/up-current side of the rock. Once you have descended along the anchor line you should drop to the part of the rock that you first see. Then you should drop down this part of the wall to the bottom. If you are on the northern side, you should see the entrance to the cave and in the normal visibility you get here (25 metres plus), you should be able to see it straight away. The sand is 40 metres or so right at the entrance and the top of the tunnel is about 27 metres. Have a quick look around before swimming through the tunnel. 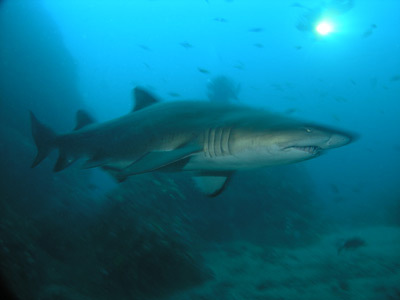 You may see grey nurse sharks in the area outside both main entrances to the tunnel and inside. Sometimes they can be seen at the very top of the tunnel. Swim through the tunnel and examine the sides and roof as you go, you can often find things like crayfish and firefish. On one of the my dives here, we were unfortunate to have such poor visibility that I did not know I was in the tunnel till I saw the lighter glow as we neared the end of it. However, this was after a week or so of extremely heavy rain and the Clarence River to the north was pouring out a huge quantity of brown water. Anyway, when you exit the tunnel, have another look for more grey nurse sharks. Start ascending and do a spiral around the rock as you go up. If you do this correctly, you can even do this dive without going into decompression, even though you have been to over 40 metres. Just keep ascending as you go around the rock. Make a run out to the tops of the U to see the other two pinnacles when you get to the right depth. 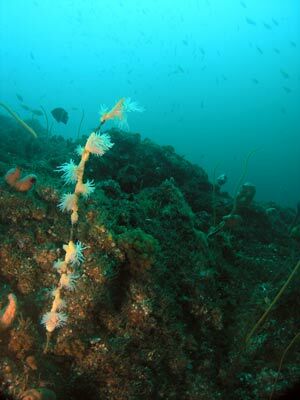 The rock is totally covered with gorgonias, corals, sponges and all sorts of fixed marine life. 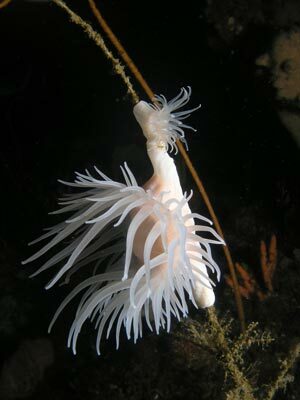 There are thousands of sea whips, nearly everyone of which has numerous tiger (or wandering) anemones on them (see the attached photos). This dive has simply amazing fishlife. Trevally, giant trevally, bream, jewfish, yellowtail kingfish and various tuna species are some of the larger species you will probably see. On my dives here we saw schools of over one hundred huge jewfish (with a few kingfish mixed in) as well as schools of over one hundred huge yellowtail kingfish. As well, there are all the normal tropical species that are seen on the other Solitary Islands. 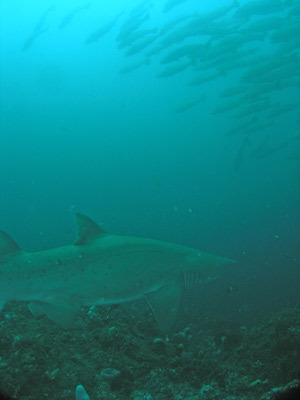 There are even grey nurse sharks higher up the walls of the rock. Once you run out of bottom time or sufficient air, ascend to five metres for your safety stop. One of the best dives you will ever do. 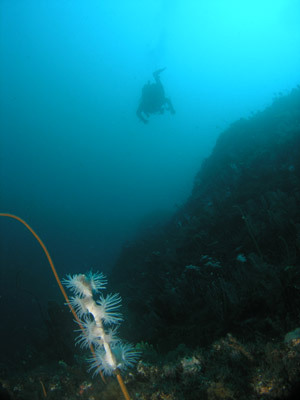 However, only for experienced divers due to the depth and the possibility of currents.